Democrat leader Hillary Clinton on Sunday issued a disagreeing statement about US President Barack Obama’s trade agenda. Hillary told a campaign rally in Des Moines, Iowa that the US president must listen to and work with his allies in Congress, starting with Nancy Pelosi, a minority leader of US who prevented the president from obtaining trade promotional authority last week. But Wednesday night, Bill Clinton muddied his wife’s message and deflated the hopes of some on the left by touting the benefits of trade deals in an appearance on ‘The Daily Show’. The former president said, “On balance, the countries that we have trade agreements with, we tend to have a balance of trade, much more than, let’s say with China”. The former American president, Bill Clinton, on Thursday, came out in defence of his namesake foundation, after it came under the scanner for its fundraising practices and acceptance of donations from foreign governments. This move is being seen as an attempt to mellow the criticism that has surfaced, ever since Hillary Rodham Clinton announced the Democratic nomination for president. Former U.S. President Bill Clinton and his wife Hillary collectively earned more than $30 million since January 2014, a financial disclosure form revealed. A Clinton campaign aide also confirmed that much of the couple's money came from their paid speeches. A financial disclosure form provided to CNN, revealed that Hillary and Bill Clinton in total have made more than $30 million since January 2014. The figures have been confirmed by a Clinton campaign aide. It was told that much couple's money came from paid speeches that were politically taxing for Hillary Clinton as she toured the country before running for President. According to the form, the Clintons have given a total of 104 paid speeches since January 2014, netting the couple $25.3 million. Questions have been raised over Clinton’s foundation’s decisions to accept foreign donations at the time when Hillary Clinton was the Secretary of State. Now, former US President Bill Clinton has defended the decision. In reports, one of the foreign governments that gave money to the foundation was that of that of Saudi Arabia, which allegedly gave between $10 million and $25 million to the Clinton Foundation. “I don't think there's anything sinister about getting wealthy people and countries that are seriously involved in development to spend their money wisely in a way that helps poor people”, said Clinton when he was on a tour of Africa for the Clinton Foundation's projects. Philadelphia artist informed that that the portrait of former President Bill Clinton that he painted includes a shadow reference to Monica Lewinsky's infamous blue dress. The artist said that at the left-hand side of it, there's a mantel in the Oval Office. "I put a shadow coming into the painting, and it does two things. It actually literally represents a shadow from a blue dress I had on a mannequin, that I had there while I was painting it, but not when he was there", he added. Washington, January 27 : United States Senator for Kentucky Rand Paul has said that Bill Clinton's behavior toward the then-intern Monica Lewinsky was "predatory". The 51-year-old politician said on NBC's "Meet the Press" that Democrat's don't have the moral high ground when it comes to women's issues as the former President took advantage of a girl who was 20 years old and an intern in his office, which is inexcusable, CBS News reported. New Delhi, Dec 31 : Former United States president Bill Clinton said that his prayers were with Formula 1 legend Michael Schumacher as the former driver battles for his life in Grenoble, France. The seven-time drivers' World Champion suffered a serious head injury in a skiing accident at Grenoble on Sunday. Schumacher, who turns 45 Jan 3, underwent a brain surgery and is currently in a medically induced coma. Pretoria/Washington, Dec 7 : US President Barack Obama and his wife Michelle will travel to South Africa next week to pay their last respects to anti-apartheid icon and South Africa's first black president Nelson Mandela. They will be joined by former US president George W. Bush and his wife Laura Bush and former president Bill Clinton and his wife, former secretary of state Hillary Clinton. According to the White House, the Americans will "pay their respects to the memory of Nelson Mandela and participate in memorial events" honouring the passing of the anti-apartheid leader. Justin Bieber apologised to Bill Clinton? Los Angeles, July 11 : Singer Justin Bieber, who was filmed while urinating in a mop bucket of a restaurant and saying "F**k Bill Clinton", has reportedly apologised to the former US president. The footage in question was shot in New York earlier this year. Eonline. com reports that a source informed that Clinton was cool about it and said something along the lines of, "If that is the worst thing you have ever done, all is well." The 19-year-old thanked Clinton on Twitter and called him a “great guy”. New York, Feb 12 : Bill Clinton and Michelle Obama could not make a win in this years Grammy's Best Spoken Word Album category. The former President and the First Lady, who were nominated for their audio book, ''Back to Work: Why We Need Smart Government for a Strong Economy' and `American Grown' respectively, lost the award to singer-songwriter Janis Ian, the New York Daily News reported. The 61-year-old Ian win the award for her audio book reading of `Society's Child: My Autobiography,' leaving behind other contenders including Ellen DeGeneres and Rachel Maddow. Washington, Jan 10 : Former US President Bill Clinton has reportedly been named the "Father of the Year" by the National Father's Day Council. According to Dan Orwig, chairman of the National Father's Day Committee, the group selected the 66-year-old American politician for his profound generosity, leadership and tireless dedication to both his public office and many philanthropic organizations, the Politico reported. Obama is doing a "better job than he's given credit for," said US President Barack Obama's Democratic Party predecessor Bill Clinton. Public perception of the president has lagged behind what he has done to benefit the country, Clinton said, speaking in Cape Town. Clinton said, "I think he's done a better job than he's given credit for. I feel very strongly about this." It sent Bill Clinton to ask Rep. Joe Sestak to back out of the Pennsylvania Democratic primary in exchange for an unpaid job as an adviser, the White House has revealed. The White House said in a report on Friday in The Washington Post that the former president approached Sestak last summer when he began his challenge to Sen. Arlen Specter, who had changed parties, from Republican to Democratic, and had President Obama's backing. Former U. S. President Bill Clinton has said that Violence or the threat of it is the "bright line" that must never be crossed in disagreements over public policy. Former U. S. president Bill Clinton has undergone heart surgery recently & said he is feeling great. He left the hospital with a mission to contribute for the Haiti relief works and waved to the cameras and smiled after undergoing emergency heart surgery. "In my capacity as UN Special Envoy for Haiti, I will continue to work with the Haitian government and people, international donors and multilateral organizations," Clinton said in a statement. New York, Jan 11 : Bill Clinton reportedly belittled Barack Obama during the Democratic run up to the presidency, resulting in Ted Kennedy endorsing the first Black US President, according to a book. Clinton helped sink his wife’s chances for an endorsement from Ted Kennedy by belittling Obama as nothing but a race-based candidate. Clinton, whose stock with black voters was so high he used to be referred to as “America’s First Black President”, severely damaged his reputation in his overheated drive to help elect his wife. Washington, Dec. 23 : Osama Bin Laden-controlled terrorists came within minutes of assassinating former US President Bill Clinton during his 1996 Philippines visit, a new book has revealed. Clinton was saved shortly before his car was due to drive over a bridge in Manila where a bomb had been planted. 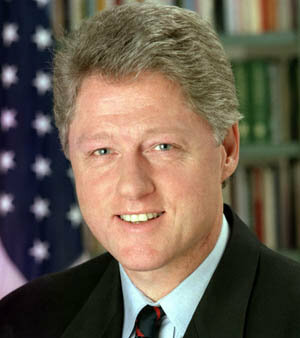 The attack came during Clinton''s visit to the Asia Pacific Economic Cooperation forum in Manila in 1996. He was scheduled to visit a local politician, his route taking him across a bridge in central Manila.